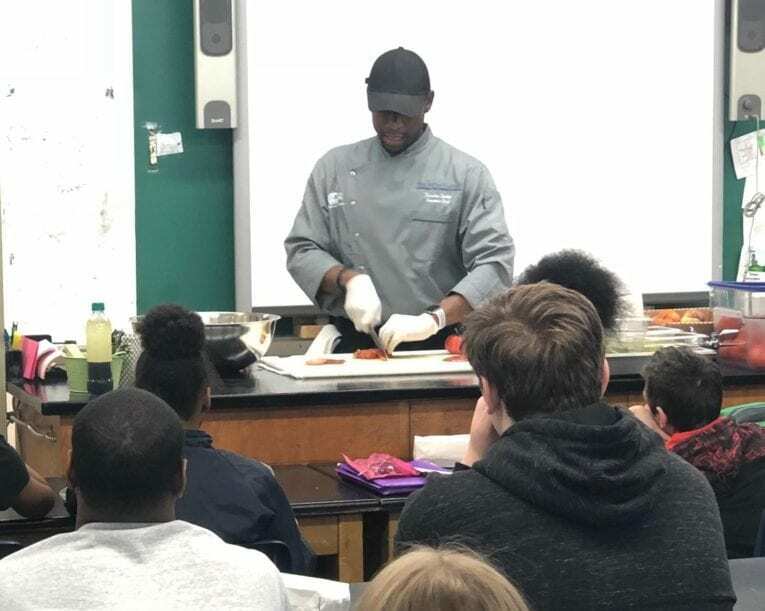 The NEW Center’s Executive Chef, Xavier Smith, attended Brown Middle School’s ‘My Future Day’ where he shared exciting details about his career as a chef while providing a special cooking demonstration. Xavier prepared a fresh tomato salsa for the local Ravenna kids that consisted of heirloom tomatoes, red onions, cilantro, minced garlic, lime juice and Himalayan sea salt. “It was an honor and a pleasure to attend ‘My Future Day’ at Brown Middle School where I was able to share my passion with the future chefs and leaders of our community.” – Xavier Smith. Contact us today to learn how Chef Xavier Smith can bring fun and creativity to your next event at the NEW Center!